The process & installation went without a hitch - plus the savings are real! We had been thinking of getting solar power for some time and decided to so in Spring last year. We also wanted to take advantage of the government rebate before it was too late. Our first step was to get some quotes which I did easily through a special ‘solar quote’ site. There are quite a few available but I used solarquotes.com.au which also has a lot of helpful information. 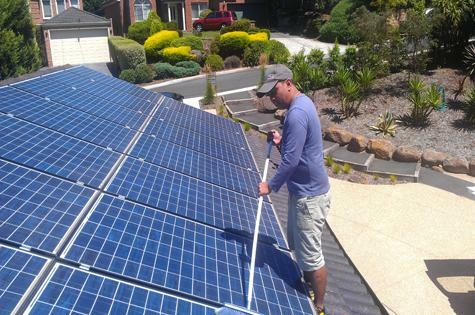 This worked very well – in no time, I had calls from three solar installation companies who discussed what our requirements and arranged to come to the house to quote accurately. During these discussions, I learned about the difference between having a solar power system with a series of micro-inverters on each panel or just one inverter for the entire system. I am using layperson’s language here so if there are any experts reading this, please excuse me if it sounds simple. Micro-inverters are useful if you do not have a lot of roof space on your house that faces north to capture the sun, or if your roofline is not a straight line. It means you can put panels in different places on the roof, with each one having its own inverter as each panel will capture the sun’s rays differently depending on the direction they’re facing. We did not need this as we have a fairly good length of roof line facing north – enough for 12 panels which has given us 3.4kW capacity. All three contractors turned-up on time to give their quote. We chose Jim’s Solar simply because they were the least expensive (although there wasn’t much difference between the three) and because they were clear about when they would get it done and how long it would take. As it turned out, on the day it was absolutely pouring but they had forewarned me that if this happened they could not have the installers working on the roof. This was confirmed with me early in the morning and they re-scheduled straight away to the next week. The installation itself took most of the day but it was done as efficiently as possible – and they cleaned up afterwards! Once it is done, your electricity provider has to inspect it and there’s some fiddling that goes on with meters but this is all handled by Jim’s Solar. Other than signing a contract initially, and giving some details for the transition to happen, I did not have to get involved that much – even in the rebate as Jim’s Solar invoices you for the net amount and arranges the rebate directly. The only negative comment I have about the experience is the ‘after installation’ component. We were visited by the contractor who supposedly showed us what to look for in our new meter, but he did this so fast it took us a while to sort it out. He also gave us a monitor for use in the house, so we know how much energy we’ve generated, how much we’ve used and how much we’re giving back to the grid but none of us have been able to make it work – not even my children who are, of course, much better with these things than me! The most pleasing part is we think we have made a really good decision. We received our first power bill since the installation last week, and I am pleased to tell you it was only $85! Compared with this time last year, that’s a reduction of more than $400 so we’re delighted. If we have a similar level of savings in future, the system will have more than paid for itself in three years – and we’re doing the right thing by the environment. We see this as a great investment, and believe solar energy is something that should be explored more broadly for the community. It is an obvious energy source for Australia.